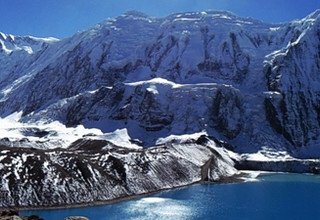 Annapurna Circuit Trek is a surreal journey that takes you to the picturesque villages, pristine lakes, and glorious mountain views of the beautiful Annapurna Region. 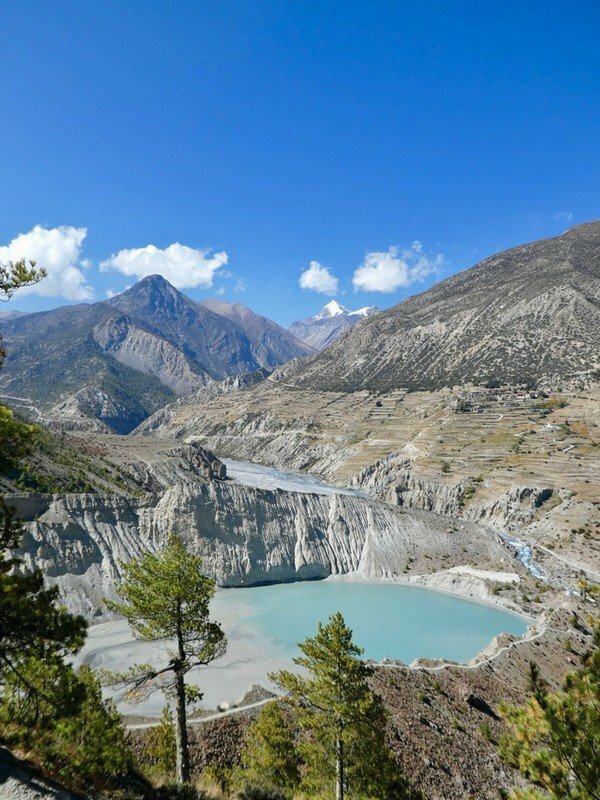 Annapurna Circuit Trekking features the highest lake in the world—Tilicho (4920m), the highest pass in Nepal—Thorong La Pass (5416m), and the holy temple of salvation—Muktinath (3800m). 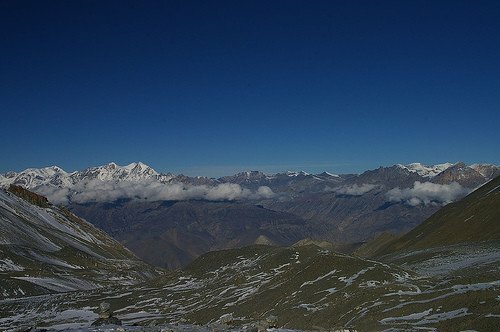 As you walk on the snowy trails, a mesmerizing panorama of the Annapurna Massif, the Dhaulagiri Massif, Nilgiri (7061m), and Machhapuchhre (6993m) among others, fill you with excitement and joy. 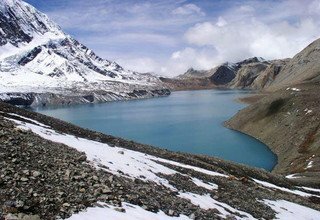 Annapurna Circuit Trekking Nepal is also an opportunity to explore the culture, tradition, lifestyle, and food of the Thakali people. 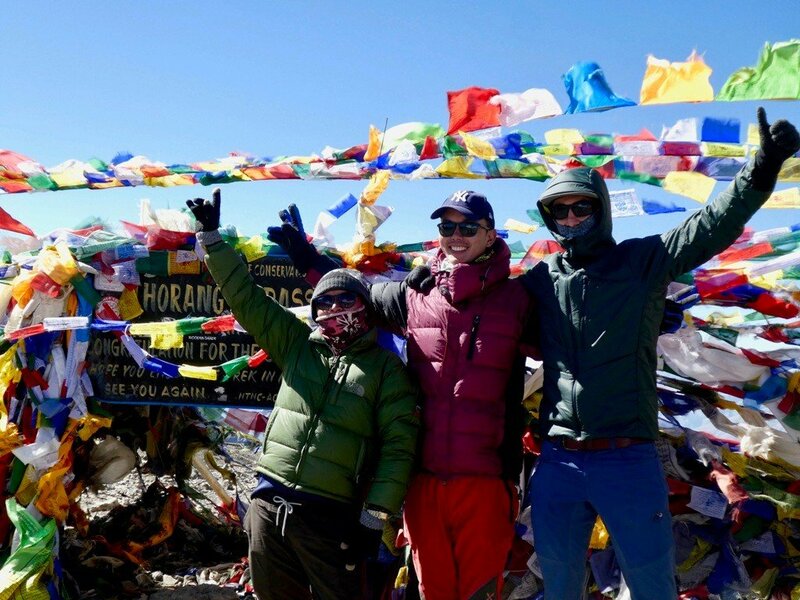 Annapurna Circuit Trek Itinerary is 20 days journey where you will be able to encounter the extraordinary mountain ranges and breathtaking landscapes. We start the trip from Kathmandu, drive to Jagat, and follow Marshyangdi river valley for the initial part. 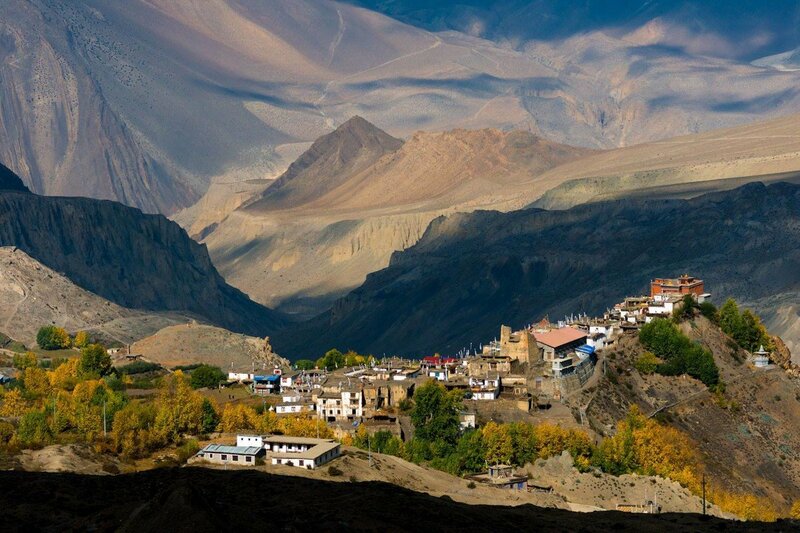 We then cross the picturesque landscape of several villages of Dharapani, Chame, Pisang, and Manang. 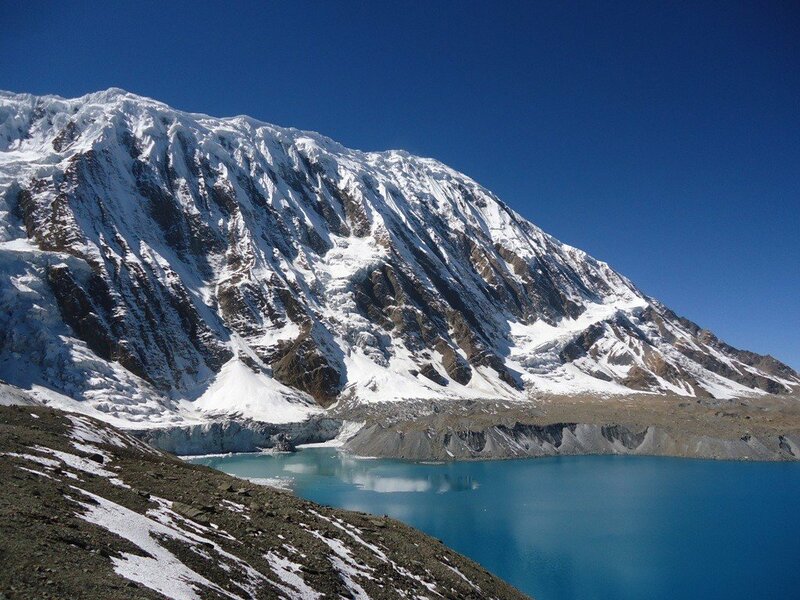 We take a side trip out of Annapurna Circuit trekking trail to the spectacular lake of Tilicho, reaching which can be tough and equally satisfying. 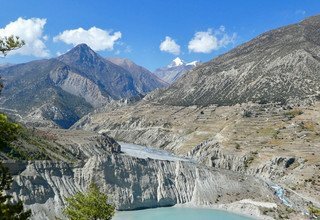 We then cross Kali Gandaki River for the latter part till we reach Thorong Phedi. 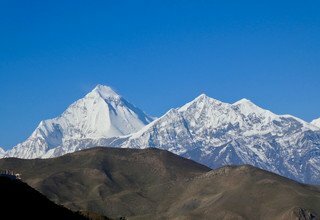 We can see Dhaulagiri and Annapurna Himalayan ranges from up close as we trek. We cross Thorong La Pass adorned with prayer flags, and visit Muktinath temple, the God of Salvation. People come here to wash their sins as they take bath in 108 taps. 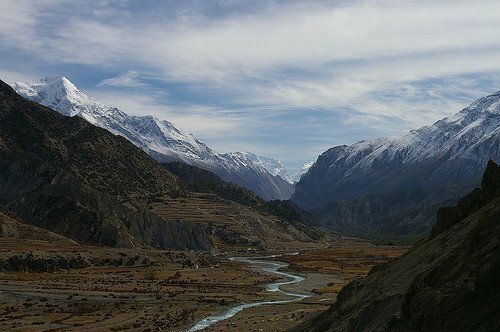 Furthermore, we reach the windy Jomsom which appears picturesque with its bare hills and sand dunes. 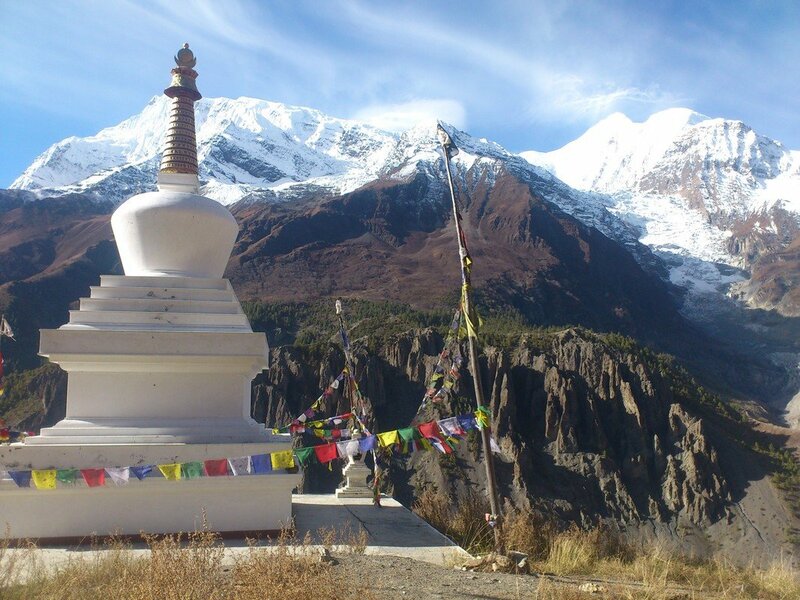 Annapurna Circuit Trek allows us to experience the lifestyle and culture of the local people. The trip will end as we move back to Kathmandu from Pokhara. With our services, which are considered to be the best in the country, the treks are safe and fun. 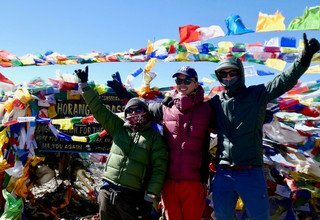 We provide you with experienced guides who are also knowledgeable about the trail. It is our responsibility to make your trip hassle-free and memorable. The temple and the religious shrines of Muktinath and its 108 brass waterspouts, Dhola Mebar Gompa (an ancient Buddhist monastery where a holy flame of natural gas burns behind a grill just above a spring). Once you arrived in Kathmandu International Airport, our representatives will be waiting for you in the arrival section. You will be greeted and be transferred to the hotel. O/N at 3-star hotel. We start a guided tour to different ancient and divine attractions in Kathmandu. Some of these milestones are enlisted as World Heritage Sites by UNESCO including the holy Hindu temple of Pashupatinath, the well-known Monkey Temple--Swayambhunath, and the Buddhist shrine of Boudhanath. In the evening, there will be a pre-trip meet-up where you will be introduced to your team members who will brief you about the trek. O/N at 3-star Hotel. Early in the morning, we drive 170km westwards to the starting point of our trekking in Jagat. The road is curvy and passes through the hills that connect us to countryside villages and farming lands. The drive moves along and crosses several main rivers flowing from the glacial mountains to the north; including the Trishuli River, a popular rafting point. At Dumre, we turn north towards Marshyangdi River to reach Besi Sahar. The drive follows Marshyangdi River towards Syange (with a high waterfall), and we drive on to Jagat (a previous toll place on the ancient salt-trade way to Tibet). Overnight at Lodge. 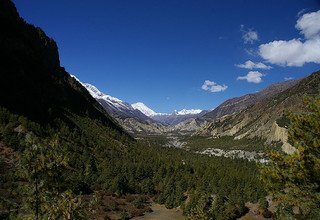 Moving along the east bank of Marshyangdi River, the track ascends slowly, before the valley opens into a large highland at Tal (1511m), the first village of Manang district. After crossing the broad flat gorge and the barley and potato fields, the trail climbs sharply on a stone stairway high above the stream. 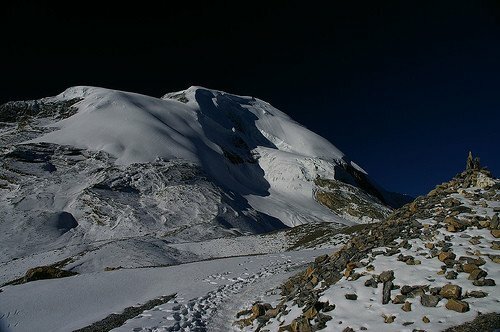 There are some sudden ups and downs on this section passing through jungles of blue pine to Dharapani (1946m). Overnight at Lodge. From Dharapani, the track passes a school, ascends, and again descends gently to Bagarchhap. 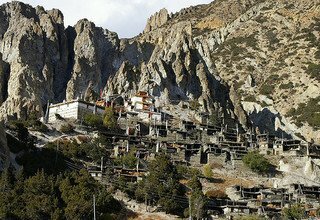 Bagarchhap is a small village with distinctive Tibetan houses and peaceful vibes of Buddhist culture. The trail ascends to the mule track through pine and fir forests and then follows the stream for some time amongst the higher oak and maple trees. 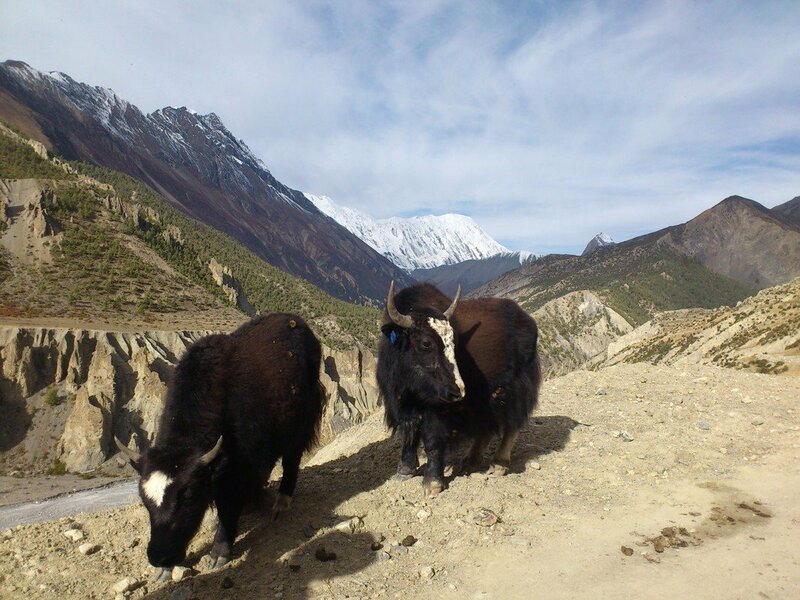 We pass through dispersed small villages before arriving in Chame (2670m). Overnight at Lodge. 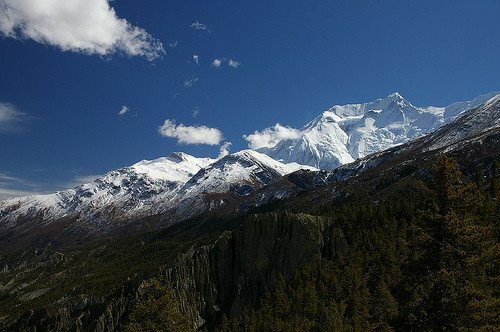 We follow the trails of Marshyangdi to Brathang from where we get a spectacular close-up view of Annapurna II (7937m). We continue the trek via the forest with the amazing Paungda Danda rock face escalating more than 5,000 feet from the stream. After passing a suspension bridge, we ascend for some time and then walk downhill to the valley floor. Finally, we walk across dry grazing land dwelling at Dhukur Pokhari. After walking for around half an hour from Dhukur Pokhari, we reach Pisang (3,190m). 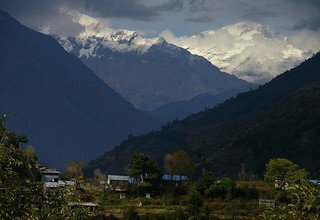 There are good views of the Annapurna range and Pisang Peak (6091m) seen from the village of Pisang. Overnight at Lodge. 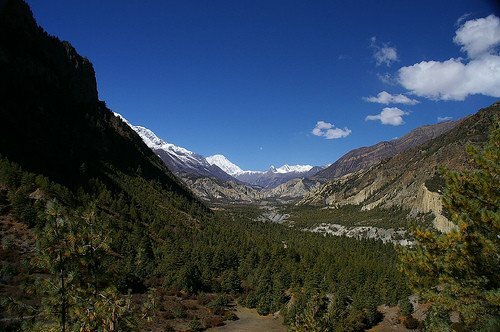 We trek on a difficult road onto the dry Nyesyang region that starts from Upper Pisang and offers some of the best landscapes. Ghyaru is a captivating cluster-village with attractively built stone houses enclosed by meadows of wheat, barley, buckwheat, potatoes, and beans. Then, along high cross with great landscape, up and down the valley, to Ngawal--an exciting village with Gompa and age-old juniper trees. The trail now slowly descends to Mungji from where we head to reach the renowned Thakali village of Manang. 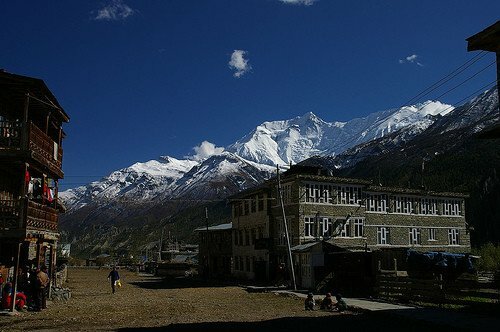 You will be enjoying with the best view of Annapurna range. Overnight at Lodge. Today is acclimatizing/rest day. 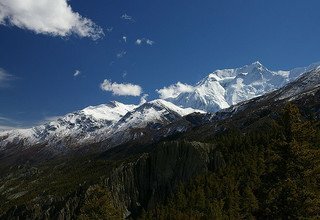 We hike to Chhunker viewpoint where we get to relish the view of the pristine Gangapurna Lake with a backdrop of the Annapurna Range, Tilicho Peak (7134m), Pisang Peak (6091m), Chulo Peak (6584m), Thorong Peak (5416m), and so on. Then we retrace back to our lodge for lunch, a typical Thakali meal. After lunch, we hike to Cave Gompa (4500m), which is again an excellent viewpoint to enjoy the Annapurna Range panorama. Then, we return back to the lodge for the overnight stay. We walk towards Khangsar village for about 2 hours and visit the monastery here. Crossing several suspension bridges over Khangsar Khola, we continue moving uphill on an unclear path until we reach Thare Gompa. 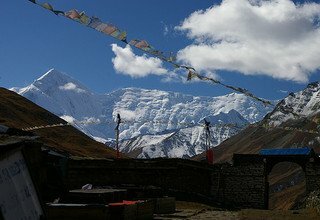 From Thare Gompa, we can have a 360-degree view of the mountains of Annapurna region. Overnight at Lodge. Following Khangsar Khola upstream, we continue climbing through an unclear trail. We cross a big landslide zone and make our way through a narrow path to arrive at Tilicho Base Camp. We will be rewarded with a close-up view of Tilicho Peak (7134m) along with other peaks of the region. Overnight at Lodge. 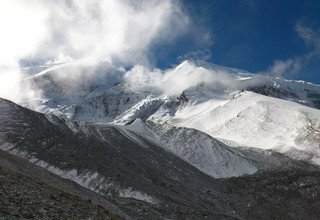 Early in the morning, the vertical track ascends for about 3 hours until we reach Tilicho Lake, the highest lake in the world for its size. 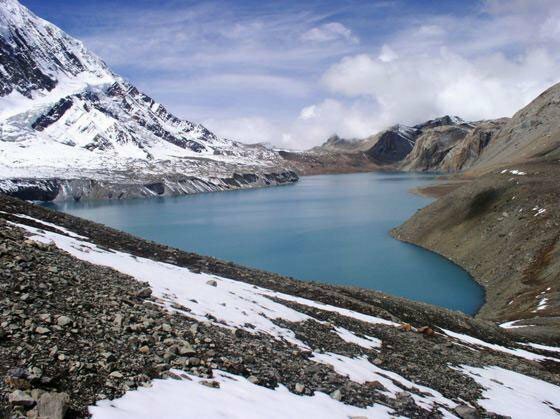 It is a breathtaking spectacle when the surrounding hills and mountains reflect upon the pristine lake. We spend some time around the lake, letting the tranquility of the environment sink in. Later, we hike back to our lodge in Tilicho Base Camp for the overnight stay. 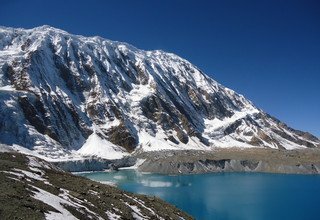 Leaving Tilicho Base Camp with fond memories of Tilicho Lake and the surrounding mountains, we retrace our way across the big landslide zone to arrive in Thare Gompa. 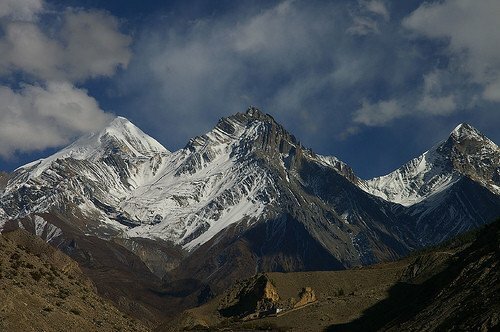 We are still accompanied by the surrounding mountains, throughout the trek. Overnight at Lodge. 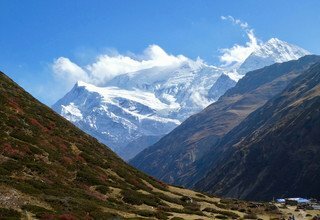 From Thare Gompa, we ascend alongside Thorung Khola and join the main Annapurna Circuit trekking trail. 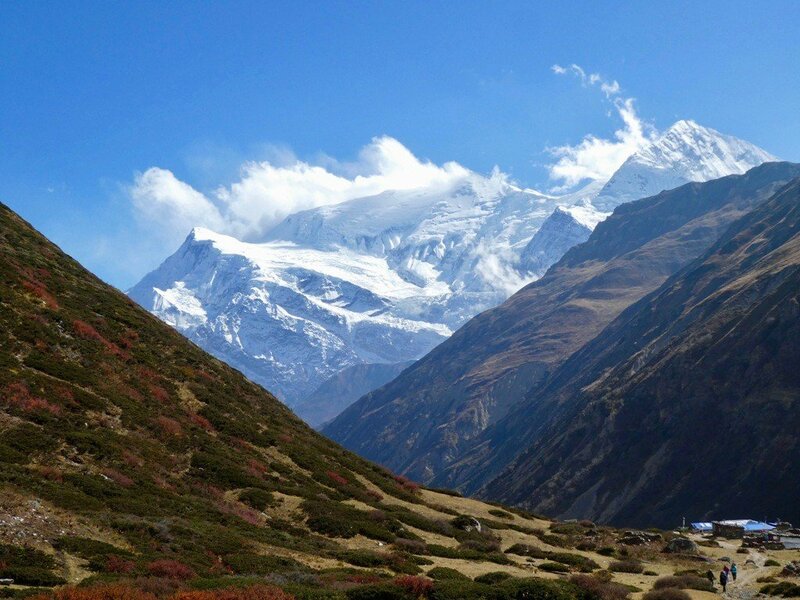 The trail ascends steeply to the village of Tenki, which is the last permanent settlement, around Thorung La. 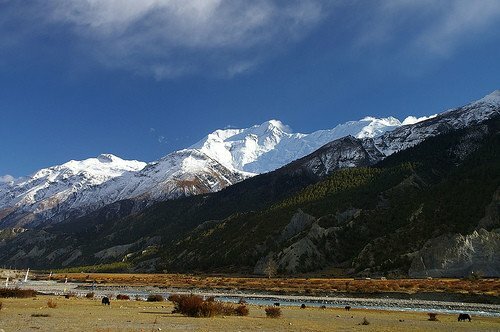 We walk a little further and then slowly outline the meadows to Yak Kharka (3900m). Overnight at Lodge. 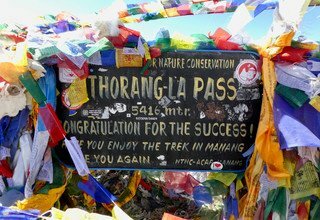 It is a difficult trek to Thorang Phedi. After walking further, we pass a suspension bridge and reach Ledar village. 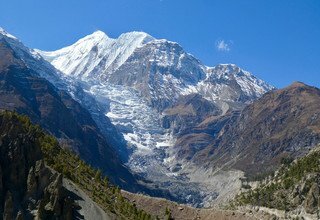 We climb furthermore and pass via immense cliffs before reaching Thorang Phedi. 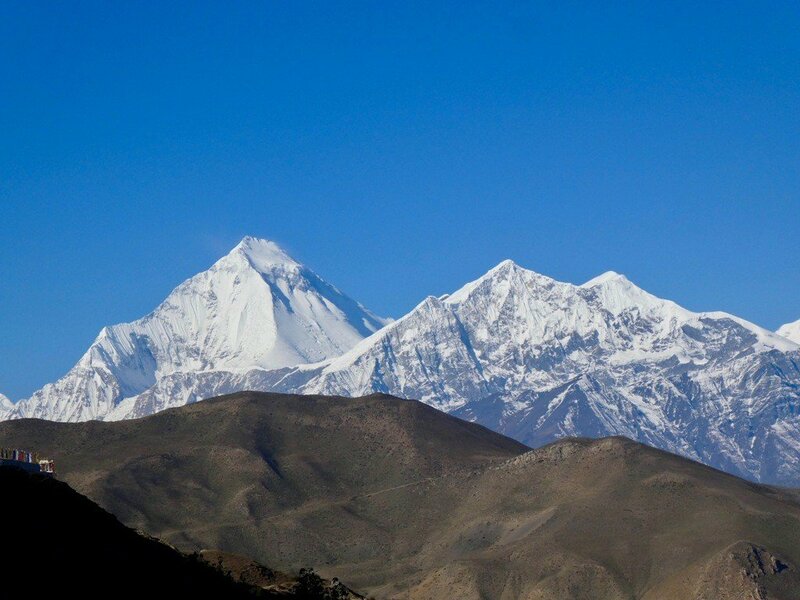 On this trip, we are able to witness one of the finest views of peaks like Gundang (5312m), Syagang (6026m), Thorung (644m), and Khatungkang (6484). 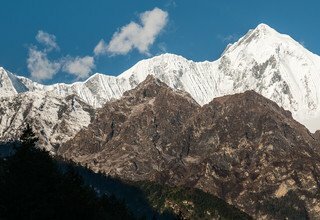 The word Phedi in Nepalese denotes the foot of a mountain. Overnight at Lodge..
We start early from Phedi as we walk up a tough trail today. 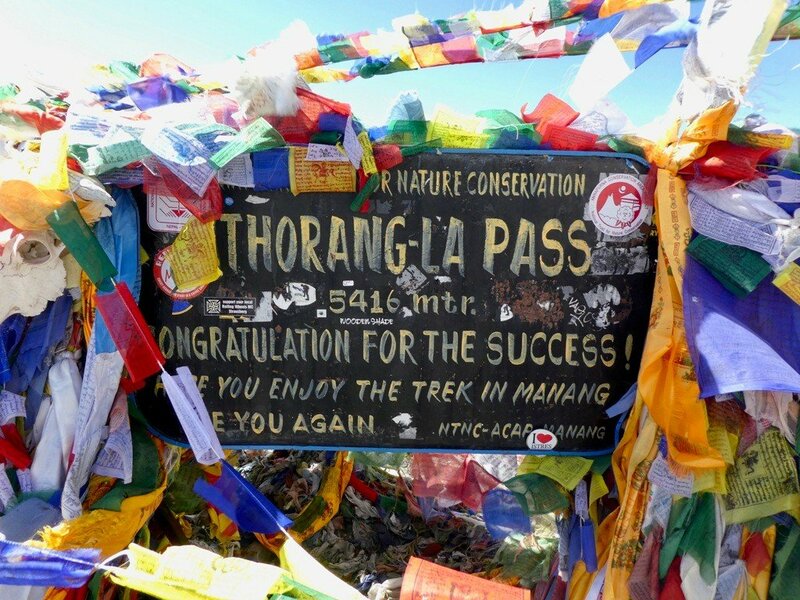 Climbing up on a steep and narrow trail, we reach the highest pass of the world, Thorong La Pass (5416m). 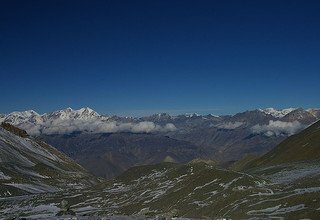 From Thorong La Pass, we can enjoy the amazing views of the Annapurna range to the south and Mukut Himal (6473m) bordering Dolpo to the west. 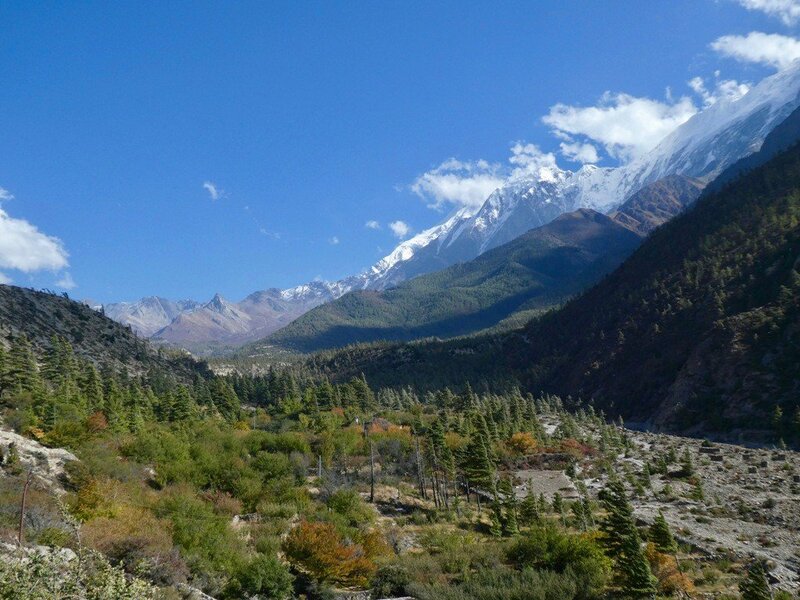 The trail goes downhill over glacial moraine, which gives way to lush fields before we reach Muktinath. This is one of the most important pilgrimage sites for Hindus. Holy water flows from the 108 carved taps surrounding the temple. Overnight at Lodge. Early in the morning, we visit the holy temple of Muktinath. You can bathe in the 108 taps which supposedly washes your sins away. Below the temple, there is an additional Buddhist monastery where we can witness the mixture of earth-water-fire that gives Muktinath its spiritual importance. 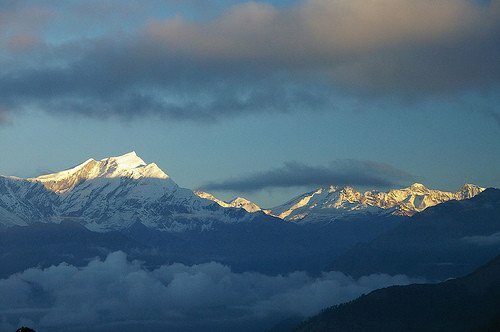 We also see the superb view of Nilgiri Himal (7061m) and Dhaulagiri I (8167m). 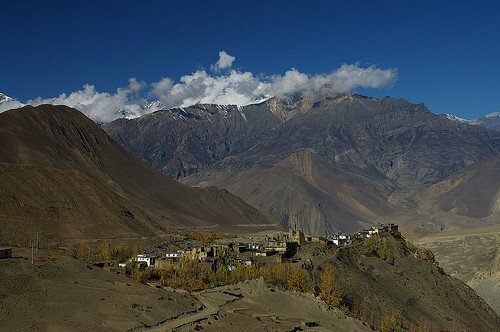 We then walk steadily to Jharkot where we visit the old nunnery and continue our walk to reach Kagbeni. Overnight at Lodge. We walk alongside the bank of Kaligandaki River until we arrive in Lubra. 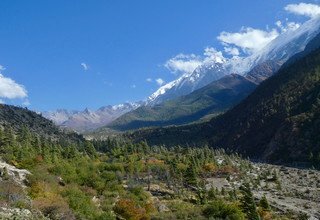 We visit Bon-Po monastery and continue our trek to Jomsom which takes about 2 hours. Jomsom is famous for the wild winds amid the barren rocky hills and sand dunes. Overnight at Lodge. Early in the morning, we take a flight back to Pokhara enjoying the scenic landscape. You can spend the day in the Lake City either sightseeing or take part in adventure sports. The town offers splendid views of Annapurna (8091m), Machhapuchhre (6993m), Dhaulagiri (8167m), and Manaslu (8156m). In the evening, you can stroll around the lakeside area. Overnight at 3-star Hotel. Late afternoon, we take a 25 minutes flight from Pokhara and fly over the mountains one last time before landing in Kathmandu. You can spend your leisure time exploring the vibrant markets of Kathmandu. Overnight at 3-star Hotel. We drop you at the airport few hours before the scheduled time of your flight. Farewell, and we hope to see you again! Important Note: In case of emergency during the trip, Helicopter will be arranged by Swiss Family Treks & Expedition GmbH. The charges must be paid by the clients themselves. * 4 nights deluxe accommodation with breakfast at 3* hotel in Kathmandu and Pokhara. 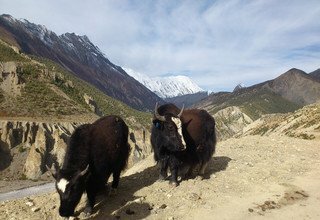 * 1 experienced, helpful and friendly guide, porters (1 porter for 2 peoples), their food & accommodation, salary, equipments & insurance. 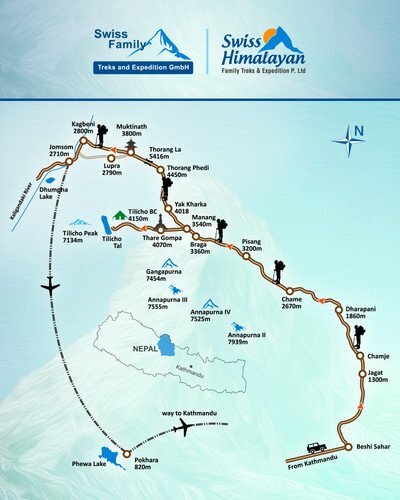 * Domestic flight from Jomsom/PKR/Kathmandu and airport tax.